There are many coach tours for a day tour of Stonehenge and the city of Bath, which leave from London and should be booked in advance. We chose Viator, which is a Trip Advisor Company and includes entrance fees. The tour happens rain or shine. Check the weather forecast and dress appropriately. It is about a 1-hour ride to Stonehenge, 1 hour from Stonehenge to Bath, and 1.5 hours from Bath back to London. The coaches have bathrooms. Food and drinks are allowed, but the tour company asks that guests not bring aboard strong smelling foods such as cheese and meat sandwiches. Coach tours are the least expensive and time efficient way to visit Stonehenge and Bath. Make sure you read the fine print to confirm tour includes entrance fees. The company we chose, Viator includes entrance fees and gives other options as well, like including a stop at Windsor Castle. 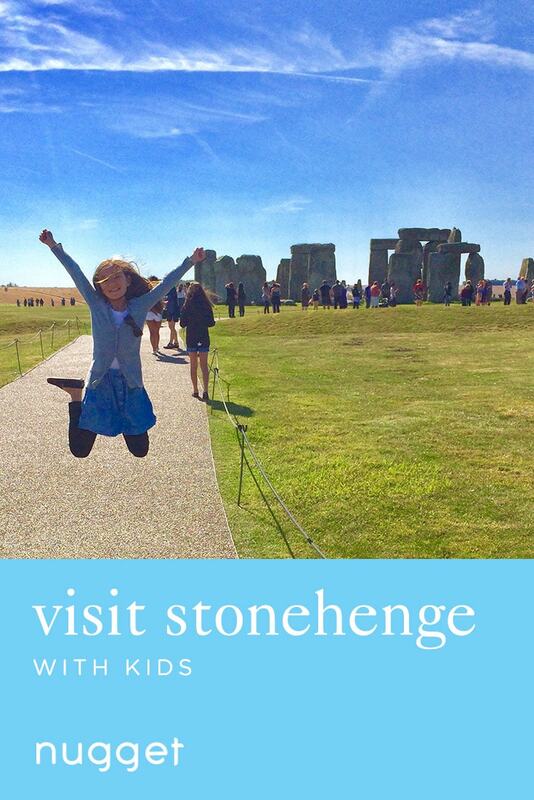 Visiting Stonehenge should be on the itinerary of every family. But when traveling abroad for the first time, organizing a day trip from another destination with kids can seem overwhelming. That’s when a good coach tour, such as a day tour to Stonehenge and the city of Bath, is exactly what’s needed. Choose well, find your seats and then spend your travel time learning history from experienced guides. Next stop: Stonehenge and the Roman city of Bath! It’s the perfect family day trip from London. The exhibits, videos and interactive activities of Stonehenge’s very kid-friendly Visitor Center, help children understand why Stonehenge is such a mystery. While exhibits contain hundreds of artifacts that have been collected at the site, small models depict the history of Stonehenge and information about the inhabitants who built it. Afterward, visitors are sent out with an audio to listen to while viewing the mammoth stones. TIP There are no bathrooms at the actual site, but there are public restrooms at the Visitor Center. There’s a restaurant with high chairs, a food/bottle warming area and kid menus. Limited to 2 hours by the tour, we opted to discover Bath on our own. (Other options were a guided tour through the city or of the Roman Baths.) The biggest surprise is how much there is to modern Bath besides its famous thermal spa founded by the Romans or even the popular Jane Austen Centre. There are many shops, cafes, museums and green spaces to explore. We spent our first hour walking through the street market and grabbing lunch at one of the local pubs, then spent the last hour walking through the city streets admiring the beautiful neoclassical architecture and reading the historical plaques before grabbing ice cream for the ride back to London.